The game for 2013 was released this morning. We will be back nightly to build and will post updates from here on out. When it was released our entire team thought this was very funny because we had developed a game similar to it during the off season. We did it to sort of practice strategy and brainstorming and were hoping to build prototypes for it but never got around to it. You can view the rules for this mock FRC game here. We started dark and early this morning at 7:45am when we left for the Houston Area kickoff at University of Houston Clear Lake. There we got to see some old friends and watch the kick off video. We also helped with kit distribution as well. From there we came back to St. Agnes Academy for our strategy session. We had several family members and alumni come and sit in with us to get a feel for this year's game. The strategy session started by first having the entire team read over the rules. This way, everyone has a very good grasp of all the rules and field dimensions. We then covered the different aspects of the game and ways we thought they could be played. This is an extremely challenging game since there is very little prior art for this type of game. The most similar robot game we can think of is the 2010 VEX game RoundUp. The pyramid structure is similar to the VEX ladder and the game objects are circular. Our brain storming session ended up with us producing this document. It's not extremely detailed but we are still learning the game. We also wanted to get a feel for some of the game objects. At around 5pm we broke to do some initial prototyping of the game devices. We really just don't know how difficult some tasks in this game are going to be. 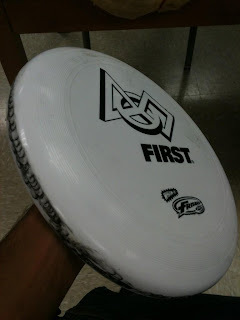 We played around with pushing discs, collecting discs, and shooting discs. We tried to collect discs using last year's collector; it actually worked alright. Our shooter prototypes aren't having too much success. So far we know it's mostly a traction problem between the wheel and the disc as you can see in this pictures. Tomorrow the plan is to get into the gym and play a little human Ultimate Ascent. We'll see how well we can throw the discs into target size cut outs and also play with strategy a bit. We might get Violet driving again and see what some of the sprint times are for certain distances. We'll also keep working on the prototypes. We have a bunch of work to do and never enough time to do it. More motor power: With the 2 added CIMs allowed and the addition of the mini-CIMs and BAG motors. FRC is again increasing the maximum allowed motor wattage. Teams are going to need to be careful and have lots of charged batteries. We're predicting a huge increase in the number of six motor drive trains this year. Size Restriction Changing: No more sizing box. 112 inch total frame perimeter. We're interested to see what teams do with this. Simple Bumper Rules: For the first time in a few years it looks like we might not have to fight with the bumper rules. No Co-Op Scoring: The number 1 seed at each event will be the team with the best record (and a few tie-breakers that you can control without scoring for the other team). This is a welcome change. Six of us put in over 15 hour days today. It looks like it's going to be a very intense build season.